We always looking for innovative new ice cream flavors. Ice cream manufacturer are trying everything to do this. Senbonmatsu Farm, located in Tochigi Prefecture, is now offering what it bills as “kiss-flavored” ice cream. But just what does a kiss taste like? People currently in a happy relationship would probably say sweet, while those who’re feeling wistful about a past love might instead describe it as bittersweet. Those who’ve just gone through a particularly nasty breakup would likely argue for sour. However, Dulceria says nope, the flavor of a kiss is apparently caramel. 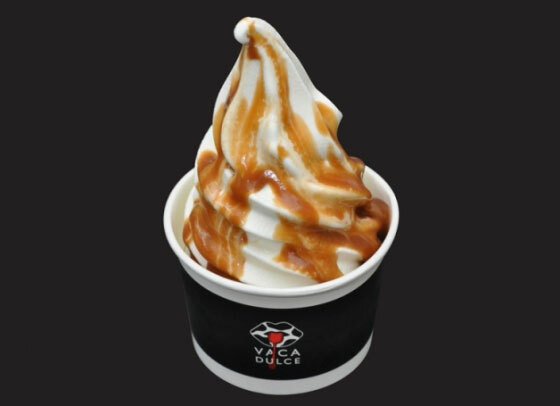 Each of the three varieties of Vaca Dulce comes drizzled with caramel sauce, made with the same Senbonmatsu Farm milk as the ice cream itself. As a matter of fact, the amount of caramel added seems to be the only difference between the three types, which all look like they use vanilla ice cream. “Butterfly kisses” usually refer to brushing your eyelashes against someone’s skin, meaning they’re not technically kisses. Meanwhile, we’ve never heard of a “bird” or “vampire” kiss. For its part, Senbonmatsu describes the 480-yen (US$4.65) Butterfly Kiss as a cuteness you can taste. The 520-yen Bird Kiss is said to be a standard kiss that’s as light as a peck from a small bird, while the top-of-the-line 580-yen Vampire Kiss has a richness that will cling to you. To go along with the unusual names, Vaca Dulce also has a strange availability schedule, as it’s only sold on weekends and holidays between 2 and 2:56 in the afternoon. Still, it does look like tasty stuff, so even if it doesn’t do anything to soothe your lonely heart, it’ll probably satisfy your sweet tooth.